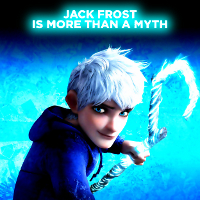 Jack Frost - Rise of the Guardians New Spot Look! 1. "I'm... snowballs and fun times." 2. "My name is Jack Frost. I love being on my own. No rules. No responsibility. It's as good as it sounds." 3. "How can I know who I am, until I find out who I was?" 4. "Hi. My name is Jack Frost, and we're gonna have a little fun." 5. "You can see me?"